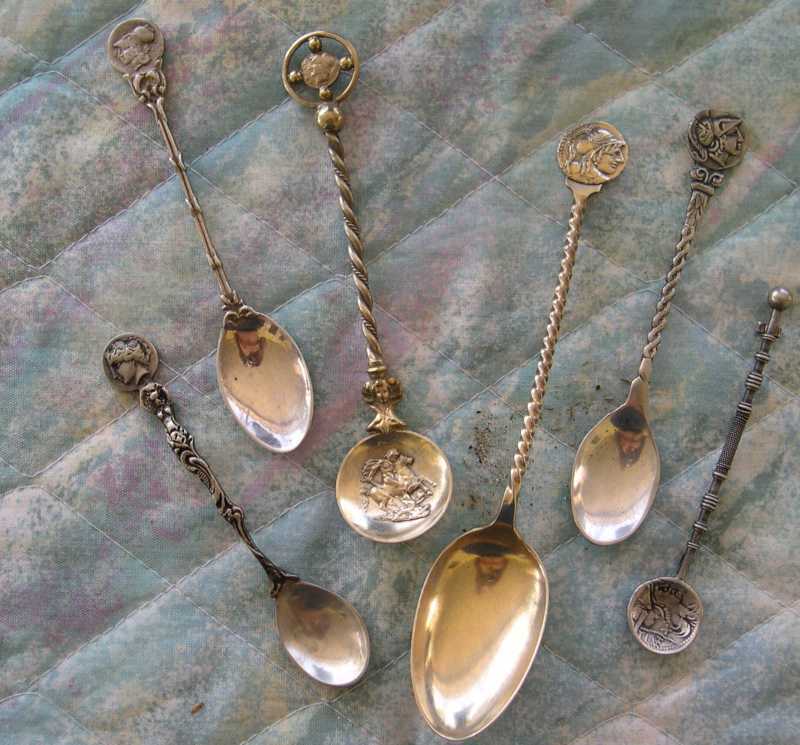 The spoons in this photograph were made using ancient silver Greek or Roman coins. I believe that these are genuine old coins. 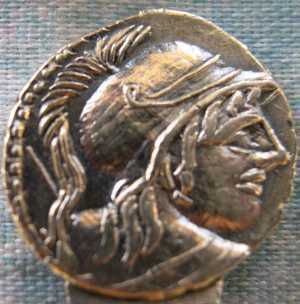 However, in recent years old Greek and Roman coins have been re-created for sale in the tourist trade. commercial reason to do so as the coins were not that valuable. 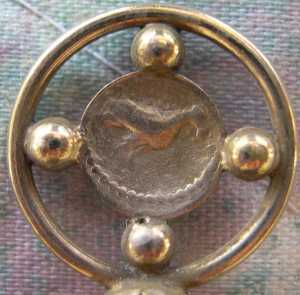 This was the first of these ancient coin spoons I obtained. 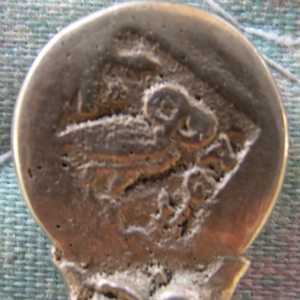 I surmised that this was an ancient coin that had been soldered onto the spoon. Thanks to Michael Marotta, Senior Staff Writer for Coin World Magazine, we have more information on this fantastic old spoon. While the coin is over 2300 years old, the spoon is probably about 100 years old. Aphrodite was the Greek goddess of love and the companion of Eros, the God of love. She also had an affair with Adonis after he was restored to life by Zeus. Adonis would spend 6 months with Aphrodite and the weather would be warm and pleasant, but the other six months without Adonis, the weather would be cold. The Greeks used this myth to explain the changing of the seasons. 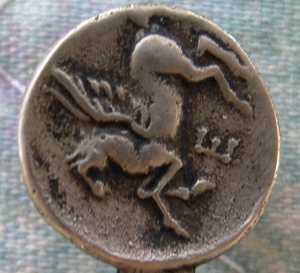 Pegasus, the winged horse, was born of the blood of the Gorgon Medusa. The horse flew to join the gods, but was captured by Athena (see below and the exhibit of Greek Spoons), who tamed the horse with a golden bridle. After many battles, Zeus turned the horse into a constellation. David N. Sear wrote the standard catalog books on Greek Coins, Roman Coins, and Byzantine coins. 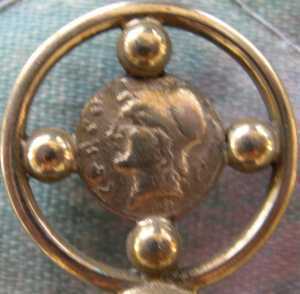 To identify an ancient coin just go SGC 1234 or RSV 123 for Sear Greek Coins or Roman Silver Coins and their Values. A "stater" is the standard coin or coin unit -- sometimes a town never minted any staters, but we can figure out what the standard was from the coins they did mint. We figure this coin was exactly halfway between the drachmon and tetradrachmon. 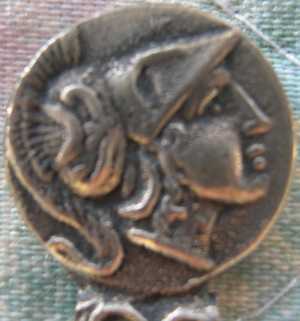 A stater is a two drachma. BUT.... Different towns had different standards. 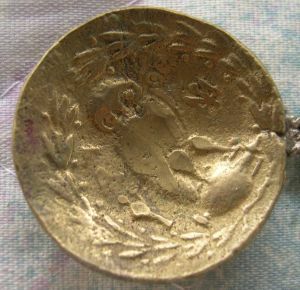 So the Corinthian you have is a half (Corinthian) stater but 3/2 of an Athenian drachma. Oh! see the New Testament. Jesus has to pay a temple tax and sends a disciple to go fishing with the instructions that he is to open up the first fish he catches and he will find a stater coin. This spoon has now been "immortalized" because the picture and information was published in Michael's "Reader's Ask" column of Coin World Magazine for Monday, October 11, 1999 on page 70. Michael, thank you for this information and the explanation. 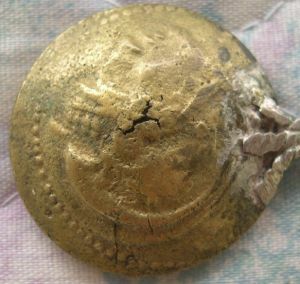 This is a very rare gold Roman coin. 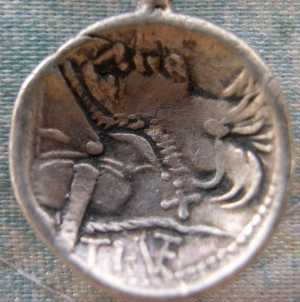 But the reverse is rather similar to my silver coin. This is a conventional American machine made spoon by the Philadelphia firm of Davis & Galt. It appears that they have soldered an ancient Roman coin to the spoon. This firm was known as an upscale silver producer and was deeply involved in the classical style of silver flatware. (It could have also been produced by a third party). They also produced silver flatware for their related high end firm, Galt & Bro. 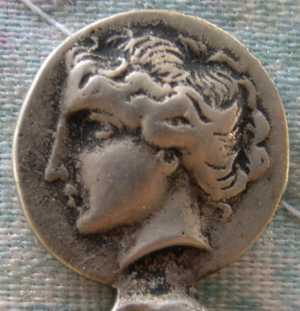 of Washington D.C.
Kevin Barry, Member ANA, ANS, was kind enough to furnish me the following information: "Your coin, if it is real, would be a Roman Republic denarius minted by Cnaius Lentulus Clodianus in 88 BC. 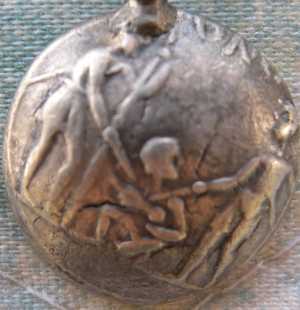 The obverse depicts the bust of Mars, seen from behind. 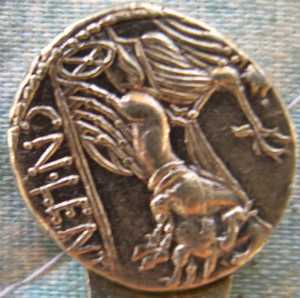 The reverse is Victory in a biga (2 horse chariot). The attribution is Cornelia 50. Now, about if it is real or not. I really cannot tell with certainty from the image. The long nose is atypical and the edges seem to be unusually regular and square. The only way for me to be certain would be to examine it. http://www.bitsofhistory.com. I thank Mr. Barry for his efforts. 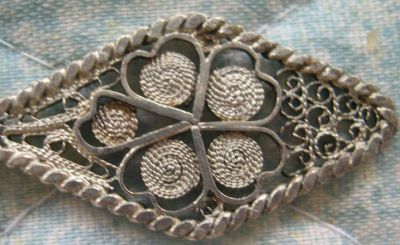 There are no markings on the spoon to indicate origin, but the silver workmanship is pretty good with nice wire woundings. 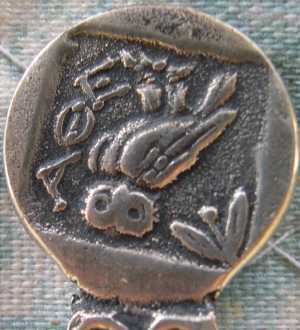 This spoon is a little different in that the bowl appears to be made from an old bronze Greek coin rather than a silver coin. Bronze coins are fairly common because they were of lesser value and were made in quantity. Furthermore there was no incentive for later generations to melt them down for a precious metal content. Not too many spoons were made with these bronze coins, so this is a nice addition to my collection. The bowl looks like it is about the size of a US half dollar coin. This is the front and back of this coin. As you can see the stress from making the bowl shape caused the old metal to crack. could have been made in many countries in the Mediterranean region. 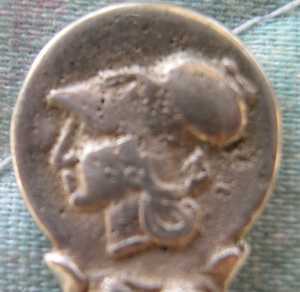 if you have any further information on this coin, please contact me.